I am a British citizen and my boyfriend is a Belgian refugee. He has been granted indefinite leave to remain in August 2016, he has ID permanent residency and a Belgian travel document. He is originally an Iraqi national but doesn't have his original passport. He is claiming benefit as he has to study language before getting a job. He is currently studying language and working as a translator on a voluntary basis and gets paid around 235 euro each month on top of his income support. Since August 2016, his income is 1100 euro per month. You state that you have lived at your address for 4 months, are a student and have been a translator since 03/08/2015. You further state that you receive an income of 1350 euro and spend around 900 euro each month but have not provided satisfactory documentary evidence in support of your stated income and evidence in support of your financial circumstances in Belgium. 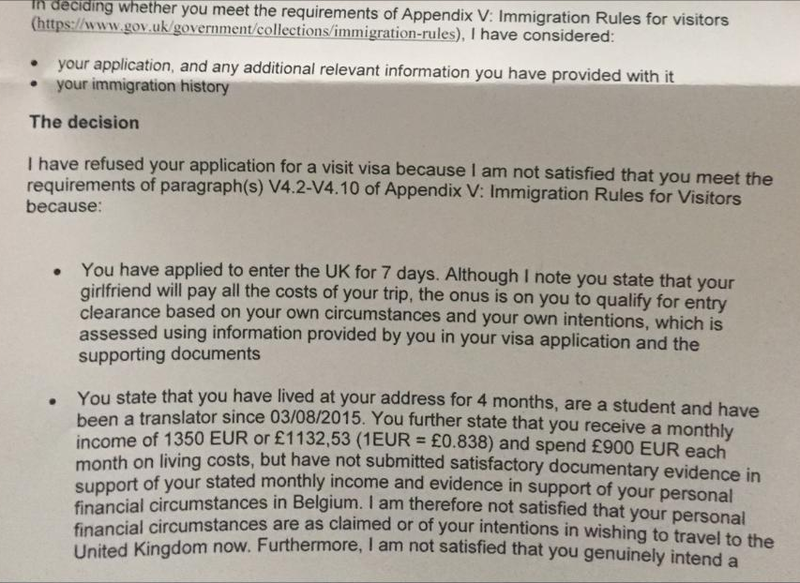 I am therefore not satisfied that your financial circumstances are as claimed or of your intention to travel to the uk now. Further more I am not satisfied that you only want a short visit in U.K. and that you will leave at the end of your visit. Employed in November 2016 for night shifts, they call him when they need him. We attached pay slips of shifts he worked so far All documents officially translated apart from bank statements. He made deposits of 1500 euro in August and 2500 in September after the first refusal. We mentioned that the money was gifts from friends and family. My questions are: With his current situation in Belgium, is he likely to get a visa approval? What can we do differently because we want to apply again? Any advice would be highly appreciated. With his current situation in Belgium, is he likely to get a visa approval? A history of multiple refusals probably means that the next application will be carefully scrutinised and needs to be meticulously prepared. It may be that your boyfriends circumstances are not sufficient to support a visit to the UK. Ideally he would have bank statements showing regular income and regular savings gradually building up sufficient savings to support himself for the planned seven day visit. What can we do differently because we want to apply again? Don't try to borrow money, or solicit "gifts" to inflate the bank balance. That probably looks like "funds parking" to the officials - you should avoid doing that. Doing so complicates the application and decreases the chances of success. From what I've read here, at a minimum, the application would need to be supported by statements from the providers of the gifts demonstrating exactly why they are motivated to provide such gifts as well as the origin of the gift funds. Another obvious difficulty is showing that he has sufficient ties to Belgium to ensure he is fullly motivated to return there after 7 days. He is a refugee in Belgium with no permanent job who is reliant on benefits payments. Unless his circumstances change, I would expect it to be more difficult than average to obtain a visitors visa. If you must meet up in the UK rather than in Belgium, he may be best advised to consult a UK lawyer who specialises in UK visitor visa applications. 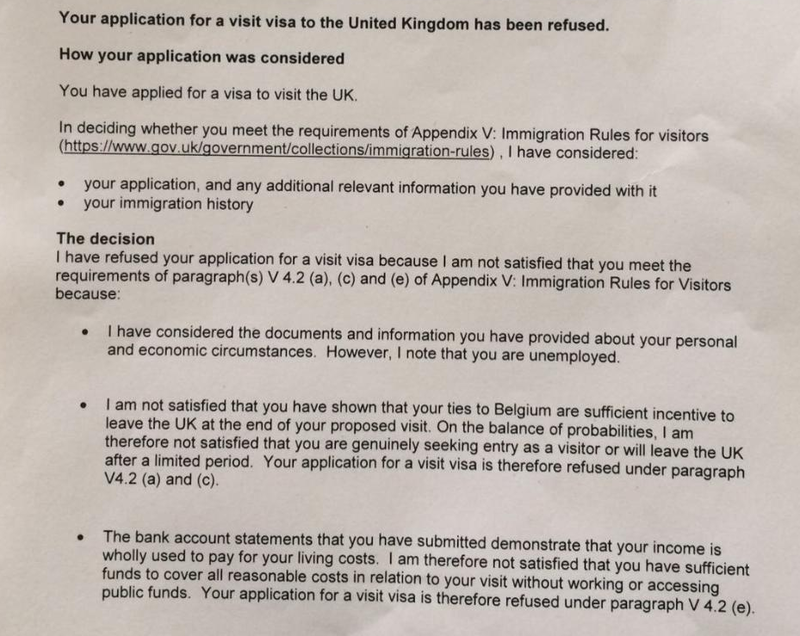 Contrast and compare to the OP's thread at http://www.immigrationboards.com/general-uk-immigration-forum/visa-rejected-twice-t221918.html posted on the same day as this one.